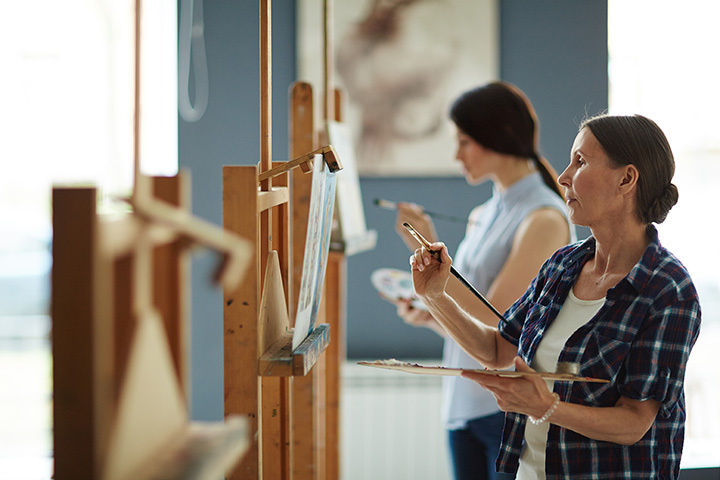 If you’re looking to get in touch with your more artistic side, Michigan has a wealth of options to hone your creative craft. From ceramics in Ann Arbor to wood painting in Marquette, there’s something to suit everyone’s style. Here are the 10 best art classes in the state. Jackson's eponymous Jackson School of the Arts focuses on small class sizes to help ensure the best in individualized instruction. That's good news for newcomers who are just getting started, but there are also advantages for those who have a little more experience. Jackson School of the Arts offers a multi-class discount as well, so for those willing to take on three or more classes at the same time, cost savings are available. You'll have plenty of options, too, from the My First Art Class for parent and child to the Pet Portrait Workshop. The Grosse Pointe Art Center, part of the Grosse Pointe Artists' Association, offers a wide range of options for artists looking for classes in Grosse Pointe. Recent classes include acrylics, Bokashi, and a special course for veterans called, “Artmaking for Veterans.” Classes rotate regularly, so even if you don't find what you'd like, you still have a potential to get something you do later on. The good news about the Kalamazoo Institute of Arts in Kalamazoo is that, if you want to take an art class, you'll be able to take one, and it doesn't even particularly matter what kind of art you want to try out. Whether you're looking for art classes for the kids—teens included—or something for yourself in ceramics, drawing, digital media, sculpture or even jewelry, you'll be able to get in on it right here. Those who want to look into different kinds of art first can do so with visiting artist workshops and other exhibitions. With classes for youth and adult alike, and a wide range of other classes available, there's a lot to like at Krasl Art Center. In fact, Krasl offers both camps and artist guilds along with classes, covering the range of options from ceramics to woodworking to painting and drawing. That's just for starters, too, as the art center routinely brings in new options. Interlochen Center for the Arts is perhaps Michigan's foremost school of art, and as such, offers some of the most extensive arts programs around. With summer arts camps, adult arts programs, and even a complete arts boarding school, pretty much the entire waterfront is covered. From music and theatre to creative writing and dance, if it has even kind of an artistic element to it, it's likely available at Interlochen. Those in the Ann Arbor area have a ready source of art classes, thanks to the Ann Arbor Art Center. With everything from one-day workshops to four-day classes on hand, covering metalsmithing, mixed media, ceramics and more, you'll have just about any kind of art class you'd like to take available under one roof. Plus, if you're looking for an unusual “date night” activity, the Ann Arbor Art Center offers a variety of these courses available. The next two coming up are painted bowls and screen printing. Hit the Birmingham/Bloomfield Art Center for some unique options in art classes. Classes include ceramics from introductory to wheelthrowing and drawing from introductory to colored pastel. Not interested in what's on hand at the time? Wait for the next set of classes, as they change regularly. Northville's Northville Art House offers a pretty impressive array of art classes for its attendees, including not only classes through the year, but also workshops and summer camps. One of the most unusual is a class called Painting with Parkinson's, an acrylics class devoted to people specifically with that condition. There are plenty of other classes here as well, including a juried art fair specifically for young artists focused on the holiday season. Even the Upper Peninsula gets in on the art bug, as you'll see with Michigan Made. Michigan Made in Marquette and Houghton focuses on products that are, as the name suggests, Michigan Made, including over 50 different varieties of Pure Michigan Win and a variety of foods. However, it's the art classes that will draw particular notice here, as they change regularly. The next one up, reports note, is wood painting, as attendees will draw a lake scene in one class. Michigan Art Center, found in Garden City, seems to focus mainly on ceramics with some sides of metalworking and other fields, which should make for a good overall mix. Despite something of a sparseness in the lineup, there's a lot to like here, including an “early bird discount” for signing up for classes in advance, small class sizes, and special events. In fact, Friday nights at the Michigan Art Center are extra special in this sense, offering a three-hour event during which attendees will make three different clay projects.